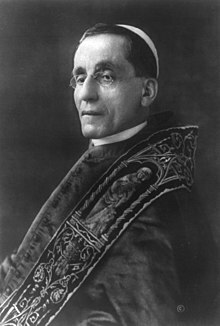 Pope Benedict XV (Latin: Benedictus PP. XV; Italian: Benedetto XV, 21 November 1854 – 22 January 1922), born Giacomo Paolo Giovanni Battista della Chiesa, was an Italian priest of the Roman Catholic Church and the 259th Pope from 1914 until his death in 1922. His pontificate was largely overshadowed by World War I.
Della Chiesa was ordained a priest on 21 December 1878. Pope Pius X made Della Chiesa Bishop of Bologna in 1907. On 25 May 1914, Della Chiesa was created a cardinal. Cardinal Della Chiesa was elected pope in 1914; and he chose to be called Benedict XV. Joan of Arc was canonized by Benedict. In 1918, Pope Benedict was excluded from the 1919 Paris Peace Conference, despite his entreaties to be made part of the talks. Benedict XV helped develop a Code of Canon Law. Benedict XV was the fourth Pope since the Kingdom of Italy took possession of Rome. Benedict XV fell ill with pneumonia (influenza) in early January 1922. He died on 22 January 1922. The Italian Government lowered its flags to half-mast; and Benedict XV was the first pope to be honored in this way. "... I remember Pope Benedict XV, that courageous prophet of peace, who guided the Church through turbulent times of war. In his footsteps I place my ministry in the service of reconciliation and harmony between peoples." ↑ "Pope Benedict XV," New Catholic Dictionary (1910); retrieved 2011-11-8. ↑ Note on ordinal numbering: Popes Benedict XI–XVI are really the 10th–15th popes with that name. This is because Benedict X is now parsed as an antipope; but during the reign of Benedict XI, this was not recognized. The "true" or actual fourteenth pope Benedict identified himself with the ordinal number XV. In other words, the numbering of popes after the 10th Benedict needs to be explained -- compare Popes Boniface VIII–IX. ↑ 4.0 4.1 4.2 4.3 Williams, Timothy. "Last Pope Benedict Focused on Ending World War I," New York Times. April 19, 2005; retrieved 2011-11-9. ↑ 5.0 5.1 McCormick, Anne O'Hare. "The Old Pope and Papal Prestige," New York Times. February 12, 1922; rtrieved 2011-11-9. ↑ "Body of Pope Benedict XV Lies in State," New York Times. January 23, 1922; retrieved 2011-11-8. "Pope Benedict XIV". Catholic Encyclopedia. New York: Robert Appleton Company. 1913.